Philadelphia Eagles head coach Doug Pederson at a press conference after defeating the New England Patriots in Super Bowl LII at U.S. Bank Stadium. If you want a good case study in how brands should interact with the NFL, just look at Bud Light and the disgraced former face of Papa's Johns. At the start of last season, when Eagles offensive lineman Lane Johnson said he'd buy Philly a ton of beer if the the team won the Super Bowl. Bud Light wasted no time jumping in on a marketing opportunity. They said they'd cover the city's beer tab. The rest is history, as we're all aware. Not only did "Philly Philly" fit seamlessly into the beer's season-long "Dilly Dilly" campaign, but Bud Light made commemorative bank off this Super Bowl victory and kept sending Johnson free beer to boot. Bud Light's courtship of Philadelphia is seemingly about to culminate with the greatest gift of all — a statue of head coach Doug Pederson. In a tweet on Thursday morning, Bud Light shared a clip of welders working on a statue that logically appears to be Pederson. 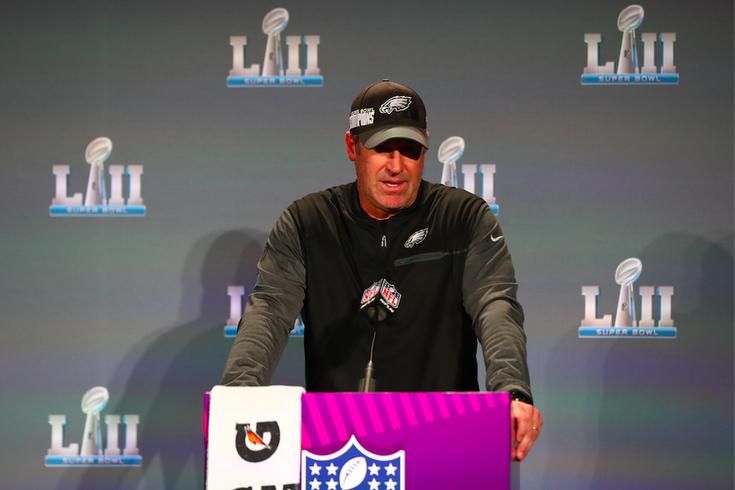 The outfit —sweater vest with Eagles logo and short sleeves — is what Pederson wore during the weekend of Super Bowl LII. Whatever it is, the delivery will be made to Lincoln Financial Field on Sept. 5, a day before the Eagles kick off the 2018-2019 season against the Atlanta Falcons.